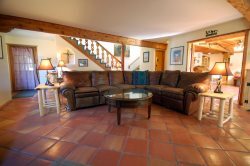 Red River Real Estate and Vacation Rentals - Last Chance, Red River, New Mexico. Last Chance is a great home that is located just a stone throw from the Red River and is located on the west end of Red River, New Mexico. This home has just been recently upgraded with all new furniture, flooring, counter tops, etc. We love our pets and we know that you do to! Last Chance is pet friendly, please contact our office staff for any questions or pricing! When you walk up the steps and enter the cabin you will be standing in the living room. Here you will have the ease of a gas log fireplace, and above that is the large flat screen TV with a DVD player giving guests the option of watching satellite or movies brought from home. The living room also has a sleeper sofa that can be pulled out into a double bed. Walking past the living room you will find the dining table and the kitchen. The kitchen has plenty of counter space and cabinet space to store things brought into the home. The appliances are all new and all stainless steel. Guests that choose to stay in the Last Chance are able to enjoy amenities such as a gas BBQ grill(gas cylinder provided, courtesy of Red River Real Estate) that can be found on the front deck. There is one bedroom that is located on the main level of this home. This bedroom is equipped with a queen bed, a flat screen TV, and access to a full hallway bathroom. The next two bedrooms are located up the stairs. The first bedroom is equipped with a king bed, a flat screen TV, and access to the upstairs full bathroom. The third bedroom has a set of double bunk beds, has a flat screen TV, and access to the upstairs full bathroom. Last Chance is walking distance to the Red River Ski and Summer Area making this a favorite cabin for anyone looking to be in a free standing home that is very close to activities such as skiing, snowboarding, and the new zip line that has been added courtesy of the Red River Ski and Summer Area. Guests that stay here area only a block away from Main Street. Last Chance does not allow garage access. Last Chance does not provide WiFi. One king bed, one queen bed, two double beds, one double sleeper. Last Chance provides satellite, and a gas BBQ grill. Last Chance pet policy: Pet friendly! Staff was helpful, friendly, and accommodating. The property was nice and we'll maintained. The house was comfortable. The house has access to the river so you can fish.